Mats Bergström, guitar. 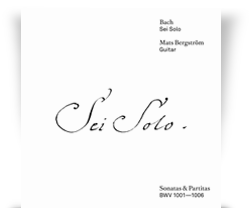 Johann Sebastian Bach: Sonatas and Partitas BWV 1001 – 1006. Mats Bergström Musik AB MBCD 05 (double CD), distr. Naxos. Recorded by Lars Nilsson at Nilento Studio. Cover by Henrik Eriksen. Nominated for a Swedish GRAMMIS award 2018.